The other night I came home and Dominique decided to serve one of her really good dinners, and I decided I'd try a wine we'd never had before. 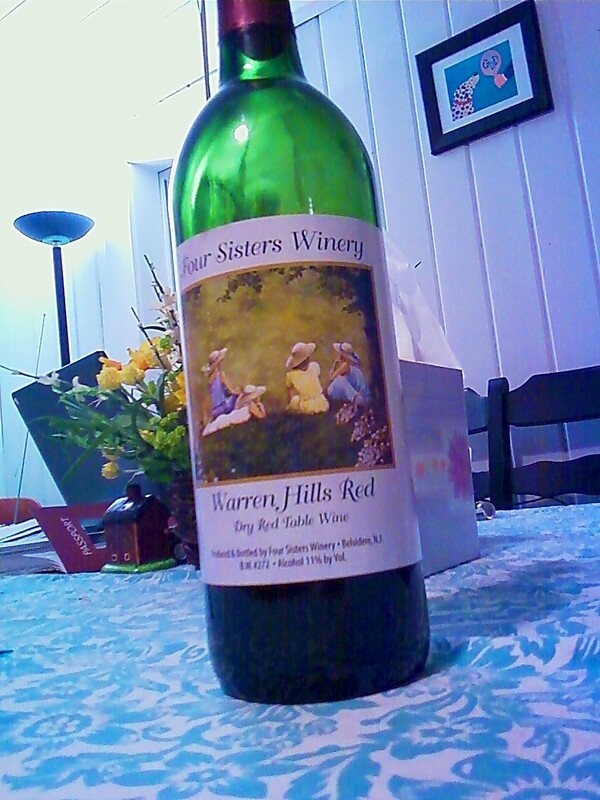 I opened a bottle up of Four Sisters Warren Hill Red. Four Sisters Winery sits nestled in a beautiful valley amidst the rolling fields and picturesque hills of Warren County, New Jersey. It is part of a 250-acre farm. 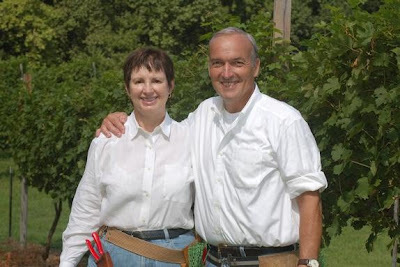 Matty and Laurie Matarazzo started the winery back in 1984. They actually started planning in 1981. They were looking for someway to invest for the future needs of their four daughters and the winery idea seemed like a perfect fit. For the first 8 years Laurie served as the winemaker while Matty handled the vineyards, harvest, and marketing. In the late 90's, Laurie, whose father had been an Episcopal Priest, felt the call and began her process of becoming ordained. She was ordained in 2003. Matty is now the official wine maker and marketing director at the winery. Matty was elected to the State Board of Agriculture where he will serve a 4 year term that started in July of 2005. Valerie Tishuk, President of Four Sisters Winery, serves as Administrator, Events Coordinator General Manager and has been with the winery for 16 years. For starters we had some white wine and steamed artichokes with melted butter. And then Dominique served a pepper and garlic roasted chicken from Red Barn, in Ghent, NY. And served it with pureed squash and wax beans. The chicken was tender and delicious. The aroma of the garlic and the spice of the salt and heavy pepper made the chicken an excellent acompaniment for red wine. Warren Hills Red is a light-bodied, dry, blended red wine. It has a big bouquet, floral with a big whiff of fresh and stewed strawberries. The wine had a lovely flavor, full of strawberry, raspberry, and bright cherry. The flavor lasts a long time. Nicely balanced. Smooth and a nice dry finish. a wonderful table red! 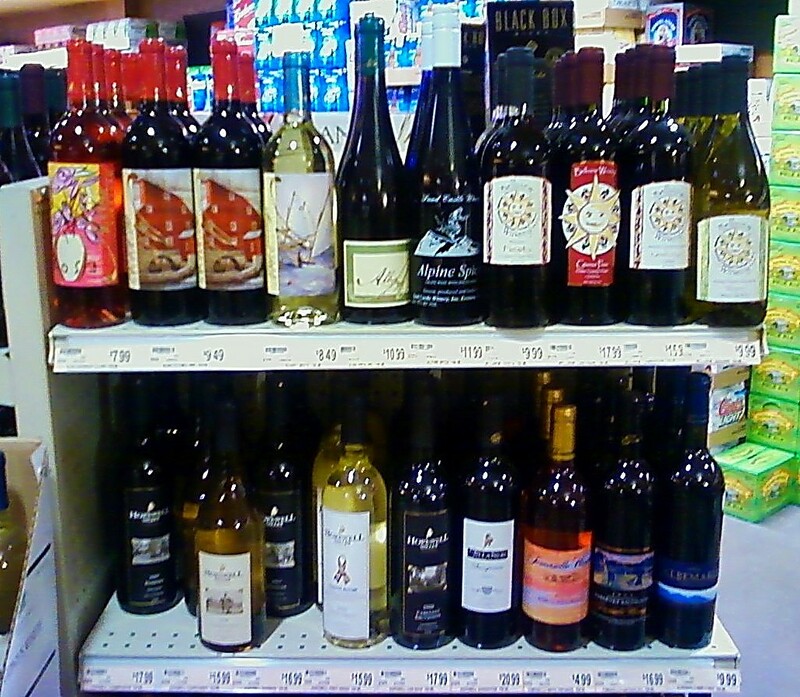 There’s no secret I was against the bill allowing grocery stores to sell wine New York. I was not against the idea, but I was against the bill. It was poorly conceived and written. But at it’s heart – allowing for more wine retailers within the state – wasn’t wrong. Now, if there is any group of retailers who should be absolutely ashamed of themselves, it’s New Jersey liquor store owners. And if there’s one thing New Jersey winery owners need to do, is that they need to do a better job of banding together and promoting their state product. There still isn’t a state wine event in Trenton or anywhere of consequence in the Mercer County area. There’s not one near Atlantic City. There’s not one in Red Bank or Montclair. Shame on you NJ wineries! But more so, New Jersey wine store owners are a horrific group, who have completely turned their backs on their state grown wines, even as New Jersey wines continue to show massive improvement. Whatever happened to “local” fellas?! I have maintained a home in New Jersey for almost fifteen years. I have driven my poor wife mad, stopping in liquor store after liquor store. And rarely am I ever pleased as a search for home grown wine products. There has been only one store that consistently, for the last ten years, has offered a selection of both New York and New Jersey wines in a wide array of labels and products – drum roll please – and the answer is? WEGMANS! 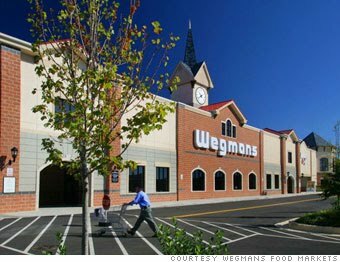 Give the devil his due – Wegman’s, a grocery store, has consistently, at two locations (Freehold and Princeton) – had the widest array of New Jersey and New York wines available anywhere! One of the best selections anywhere. Anytime. End of conversation. From popular fare to quality wines, Wegmans has never failed to carry local dry sophisticated wines and sweet dessert wines. There are more famous wine retailors in New Jersey - bigger, slicker, more elite, more savvy - but the best retailor of local wines is a grocery store. And you know what the worst part is? They're from outta state! They're from New York, where the lobbyists won't even let grocery stores sell wine! You can't make it up. And you'll never hear Danny Wegman say the word "shizzle." 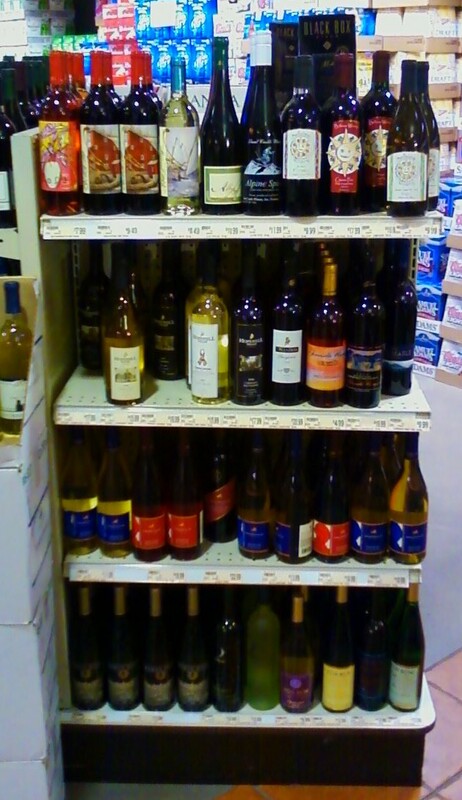 Here are a few photos so you can see two or three sides of a fixture loaded with local wine. John and Jan Landis' path into the ancient art of winemaking began in 1972 as Jan was editing a book called "Homesteading." Piqued by the possibilities, they purchased a 5 acre farm in Breinigsville, PA in 1973. Extensive research into soil and weather conditions led them to plant their first fifty vines in 1974. 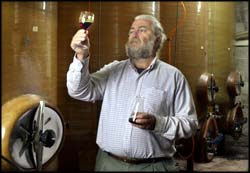 John applied his background to courses in enology and viticulture as Vynecrest Winery officially opened its doors in 1989. In 1994, the Landis' purchased an additional 29 acres of land adjacent to the existing vineyard and began planting first of many separate vineyard blocks on this new land. John was recently the president of the Pennsylvania Wine Association (PWA) and presently serves on the PA Wine Commodity Board. Jan was president of the Lehigh Valley Wine Trail for four years and has initiated events such as the Passport Program - March Madness for Wine Lovers - and the Wine Trail Harvest Weekend. Sam, a 1998 BA graduate of Williams College, rejoined the family business in 2002 after working in California for E&J Gallo. 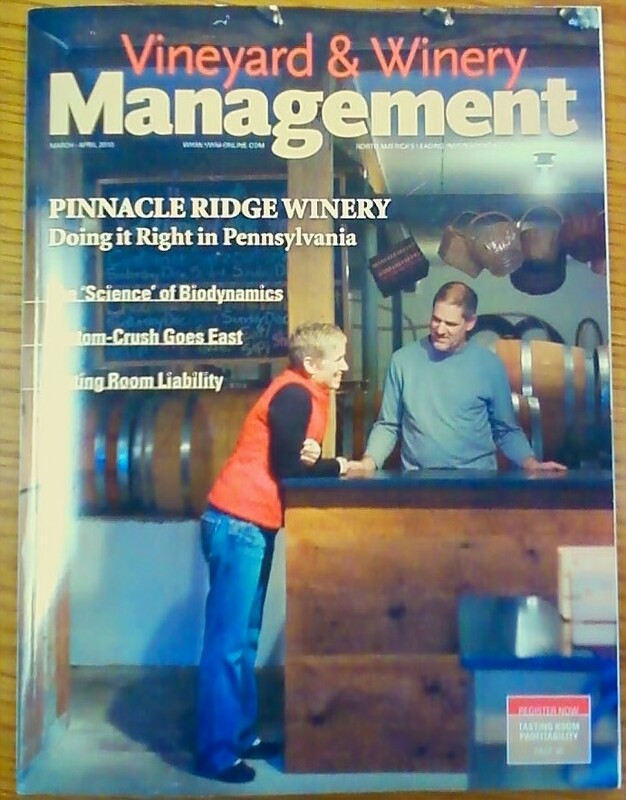 Sam assists in the winemaking, is involved in promotion and now serves on the PWA Board in Harrisburg. 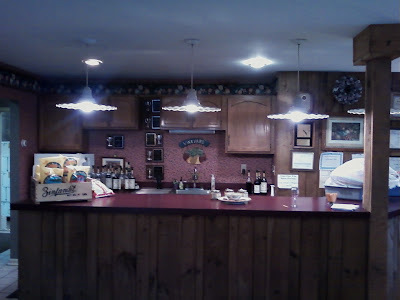 In 1997, Vynecrest became a charter member of the Lehigh Valley Wine Trail and moved its original tasting room from the lower section of the barn into a newly renovated upper section, which today still remains as their featured tasting area. The Landis's claim that Lemberger is their flagship wine. 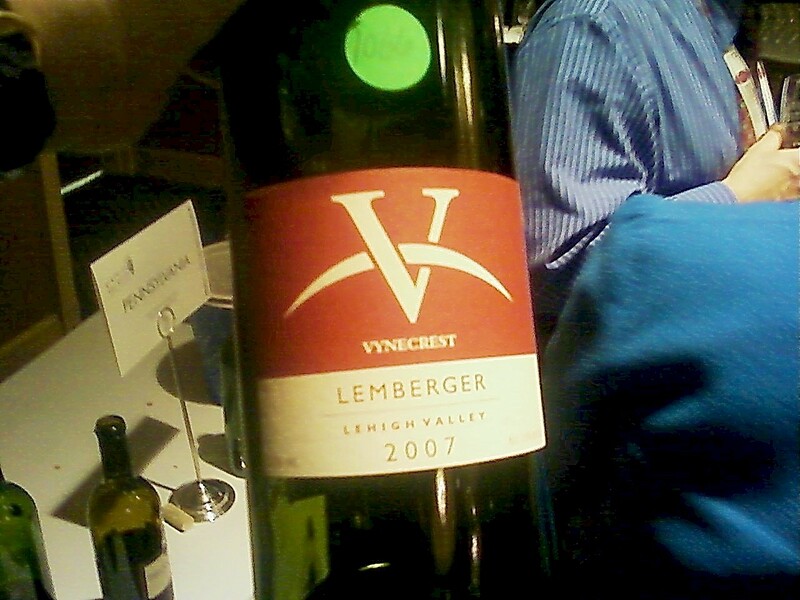 Now, I am not historically a Lemberger fan, so you know this wine must have been an exception. This was a medium-bodied dry red wine. It had big bold fruit up front, with some dark cherry and some raspberry, nice acids, and a smooth, rich finish. Nice tannins. Well balanced. A great red wine! And one of only a few Lembergers I would recommend! 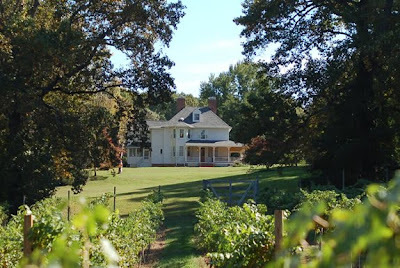 The Federal-period home Chatham in Machipongo, VA, was begun in 1818 by Major Scarborough Pitts on land on Church Creek first patented in 1640. The buildings on the property reflect four centuries of continuous use as a working farm. The latest addition is the winery built in 2005. In 1999, the first five acre block of grapes were planted and today there are more than twenty acres of French Vinifera. The winery was constructed in 2005 and currently has a production capacity of 3,000 to 5,000 cases annually. 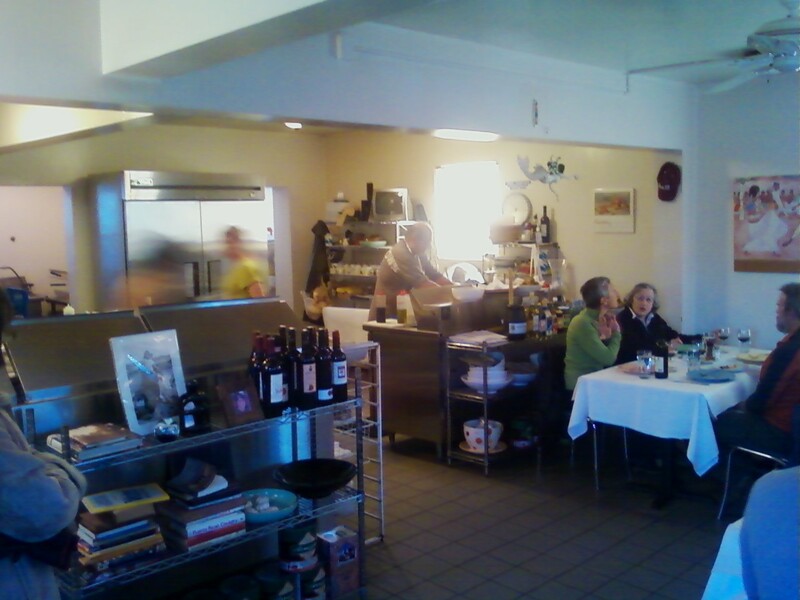 A retail tasting room is located in the winery. Future plans include the relocation and restoration of an 1890s farmhouse adjoining the winery to serve as a tasting room and special events facility. The Church Creek Merlot 2006 was a wonderful surprise! 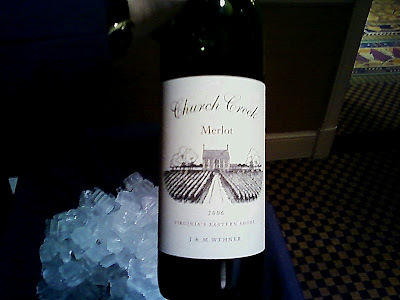 The Merlot is a mouthful of dark cherry, blackberry, and a touch of currant and raspberry. A big up front fruit flavor gives way to a beautiful dry finish, with lovely balance between the fruit and the acidity, and a nice touch of tannin. The wine is barrel-aged for more than twenty months. A tremendous surprise! A lovely, lovely wine! 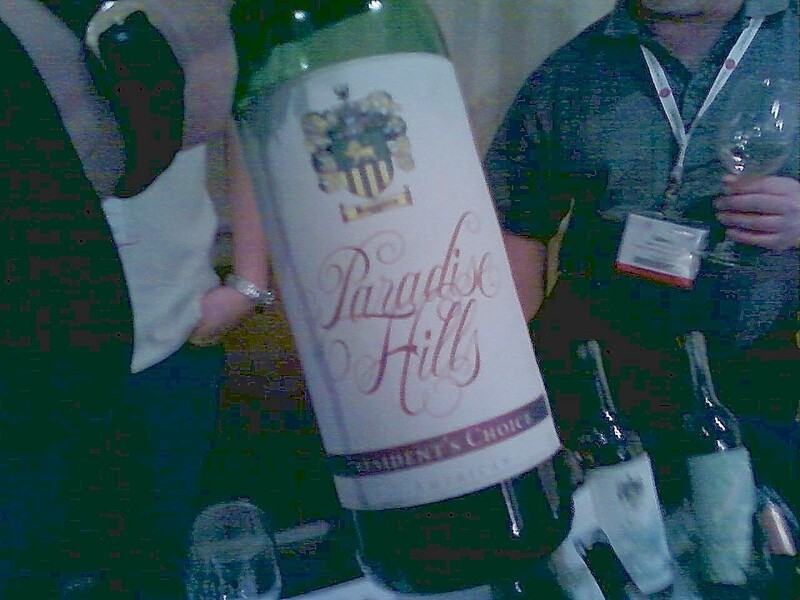 So, while I was at Wineries Unlimited, I tasted a wonderful Connecticut wine, President's Reserve from Paradise Hills Vineyard & Winery, located at 15 Windswept Hill Road, in Wallingford, CT. They are on the Washington Trail, on which the General marched scrounging up recruits and supplies during the Revolutionary War. 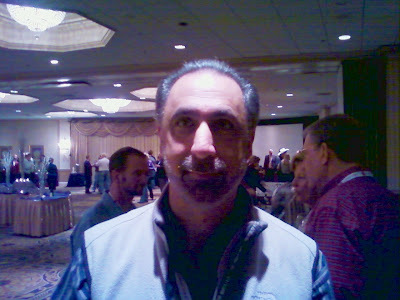 Richard Ruggiero is the founder. "We're a bonded winery and the tasting room is being finished now. Paradise Hills will open sometime in June or July of 2010. It's a Tuscan style building, with a very relaxing Tuscan style atmosphere. There will be six or seven wines available for tasting when the tasting room opens," said Richard Ruggiero. "We grow seven different varieties on 5 acres, planted on a 65 acre farm," Ruggiero added. So, there's plenty of room for growth. Building the tastingroom is taking up a lot of their attention this spring. But then, the following spring, they intend on planting a few more acres, and then some more. They grow mostly Chardonnay. They will offer a 100% Estate Chardonnay. 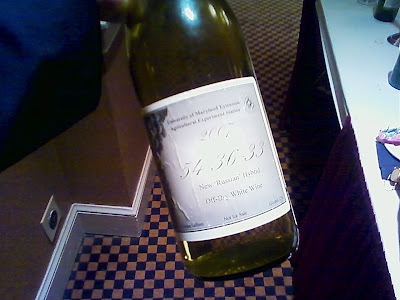 "Some is blended with Seyval Blanc to make Washington Trail White," said Ruggerio. They will also be offering Washington Trail Red, which is a Rhone-ish red wine, light and fruity. It is predominantly Chambourcin. What I tasted was President's Choice, the biggest of their red wines that will be available when the tastingroom opens. President's Choice is made from Chambourcin, Cabernet Sauvignon, and Merlot. The Chambourcin is estate grown. The wine has some oak to it. This is a lovely, medium-bodied, garnet red colored dry red wine. There were lots of dark cherry, plum, and a touch of raspberry, with a hint of vanilla and oak. Excellent balance, with nice fruit up front, and solid tannin s and acidity to make for a well balanced wine. A very nice wine. I liked very much! Great with grilled meats, spicy pasta dishes, and with some aged Parmesan or Cheddar. Really looking forward to when they open!!!! By their own admission the owners of Berkshire Brewing will openly tell you they are Massachusetts best kept secret. But I've never been good at keeping secrets. 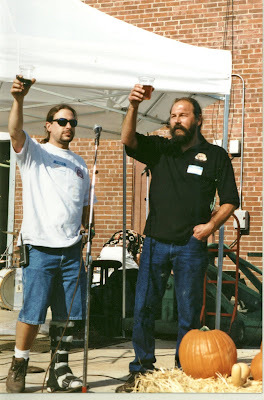 In 1992, Chris Lalli and Gary Bogoff of Montgomery, MA came to the conclusion that they both had a similar interest in life...to make beer. Ale that was produced with the same ethics and craftsmanship of an artisan. After three long years of planning and test brewing, and months of searching up and down the Pioneer Valley for the right location, BBC found a home in historic South Deerfield, MA. The building, a former cigar manufacturing plant became the prime choice site. 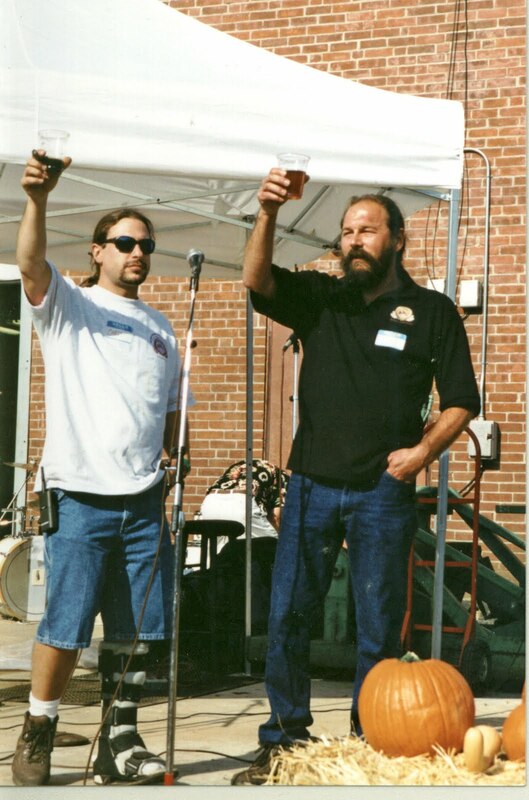 In the winter of 1994 construction began to renovate the brewery site. It was no small feat to transform the cigar factory into a cutting-edge micro brewery. 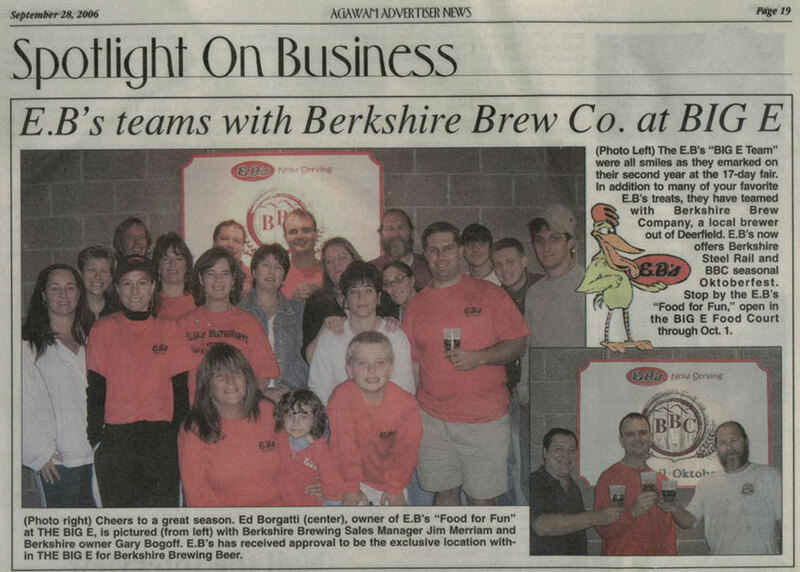 The brewery was a hit. By 1999 BBC was in need of more space. Gary and Chris began an expansion by building a 3,000 square foot addition on the north side for the office. Since 1999, there have been many changes with our physical building and product distribution. 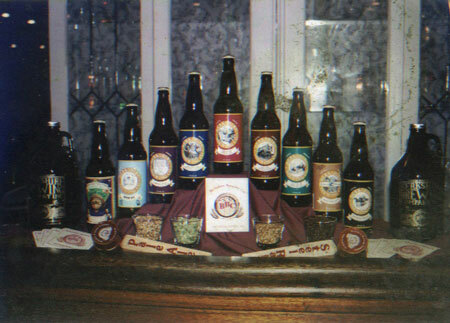 In January 2003, BBC brought on G. Housen, a distributor in Vermont. In April 2005, BBC opened a warehouse in Worcester, MA. Then in August 2005, BBC started self distributing in Connecticut. 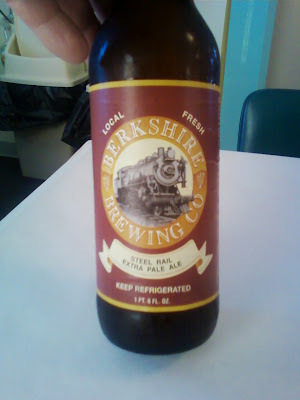 By 2008, Berkshire Brewing was no longer a Micro brewery but was now a Regional powerhouse. 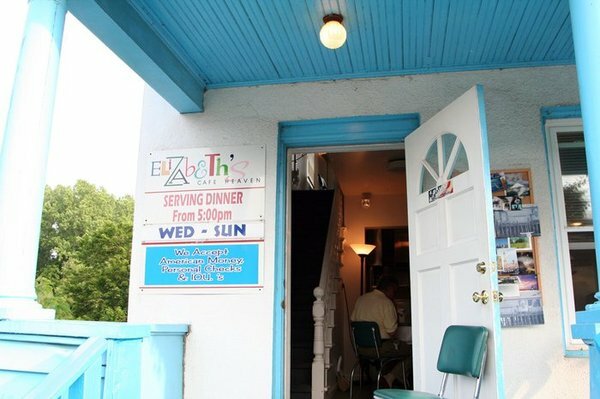 So I was out last night at Elizabeth's Restaurant in Pittsfield, MA. There we had a tremendous salad of romain lettuce, strawberries, cheddar cheese, kiwi, and other greens (exceptional salad) and I had a Eggplant Provencal, a French version of Eggplant Parm (again, excellent!). Anyway, they had one of Berkshire Brewing's offerings on the menu, an I ordered one up. A 22 oz. bottle of Steel Rail Extra Pale Ale. It was a big tasty brew. This is their flagship bale. It was light in color and medium bodied. It's a big cloudy ale, with lots of malt and lots of hops. A nice tangy bitterness left you with a dry and refreshed mouth. 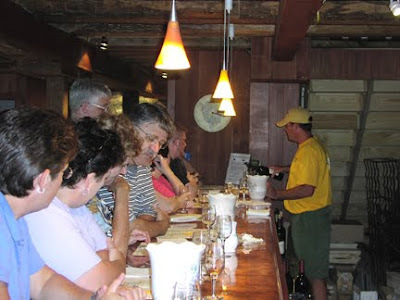 The Lehigh Wine Trail is one of the best wine trails on the east coast. The fertile farmlands, rich in shale and limestone and favored with a moderated climate, provide an ideal growing environment for vineyards of both traditional Vinifera wine grapes and Native American grapes. The area’s close proximity to Philadelphia and New York City make the Lehigh Valley Wine Trail a beautiful and easy escape for the wine lover. The Lehigh Valley Wine Trail is a non-profit organization composed of nine family-owned wineries to promote premium Pennsylvania wines from the Lehigh Valley. The wine trail displays one of the largest wineries in the state, a few mid-sized wineries and several boutique wineries. 1. Wonderful wineres from top down. I'm a big fan of Blue Mountain (since back when they both hard dark, long hair). Big fan of Pinnacle Ridge. Clover Hill is a very strong, and very smart operation. Vyncrest is a successful mid-sized organization. 2. Solid wine up and down the trail. Five of the nine wineries have won the Governor's Cup in the last five years! That's not just luck! That's a commitment to quality! 3. Picked a grape and stuck with it - Chambourcin. They make no excuses. Everyone one on the trail makes one. No questions asked. And they do an event every year where they do a nouveau with Chambourcin. Very, very smart. And all the Chambourcins are from Good to Great. 4. Fairly easy to get up and down the trail. 5. Great events (five yearly) and great passport program. If your a local and like wine, you're crazy not to be on their passport program. Not onl are there wonderful events, you get discounts at participating businesses - lodging, dining, and other local businesses. Their March Maddness tasting menu is four dishes per winery, at every winery. Now that's value! 6. Lehigh Valley Cookbook - enough said! Congratulations to Brad Knapp and Christy Allen of Pinnacle Ridge. Great coup! Pinnacle Ridge has been making some great wines over the last ten years. Nice to see some recognition. 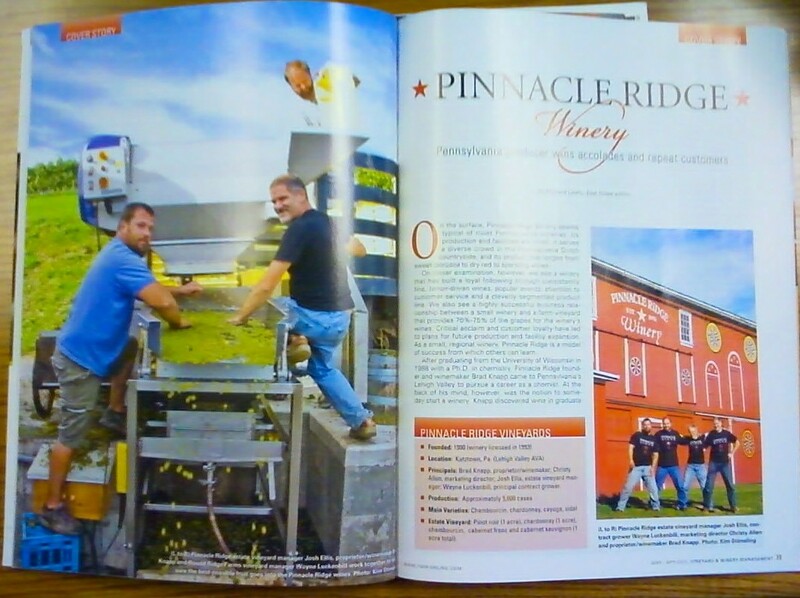 Also, props to Josh Ellis, vineyard manager, and Wayne Luckenbill, the grower/owner at Round Ridge Farms! Scott Osborn is a polarizing figure. A character right out of Shakespeare. I like him. I don’t agree with him fully, but I like him. And there is a lot to say about him. For the record, I am not a personal friend. We are acquaintances. We have met. I don’t know anything about him – not his favorite color nor food, if he cheats at cards or Monopoly, if he likes dogs or cats (I do know he likes to wear his baseball cap, as I have seen on numerous occasions). I am not his choice of friend at a cocktail party, nor for a Monday Night Football game. We will never go to Lincoln Center to see an opera nor a ballet together. I won’t be invited to a birthday party. And I am not offended for it. There are many things about Scott I like though, even if from afar. He has built an incredible business. He has a tremendous winemaker and great marketing people, and he has built a formidable machine up from an old winery he bought, refurbished, and reinvented. The winery produces great wines. He has created one of the biggest names in the New York wine business. He has created a model other wineries would like to emulate. His winery holds its own against competition from around the state, and around the country. If there are a handful of New York state wineries, ready to break out of New York in a meaningful way, Fox Run Vineyards will be among them. Scott has been for the last 6-10 years one of the biggest boosters of New York state wine. Yes, he had self-interests of his own, but he has been an ambassador for New York wine for almost a solid decade. 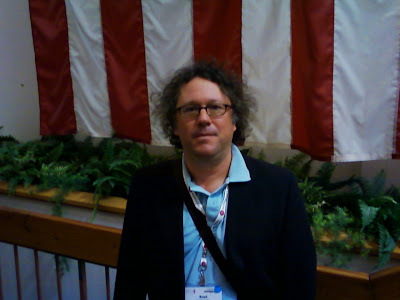 He has been seen at all the big tastings, big wine events, big charity events, and New York state wine conferences. He stood in for all the New York wineries, when it came to pony-ing up. He cares about New York’s reputation, and he’s put his money where his mouth is. He’s been out there hitting, blocking, and tackling on all the big issues for New York state wine, since I was still a puppy. He has been, for better or for worse, out there, front and center, trying to gather the world’s interest on behalf of New York wine. And for that, we must all say THANK YOU. Scott is no saint. He also has a right to be angry. There are not enough outlets to sell his wine. He can’t grow to the next level stuck in the box that is New York. This stage is too small, the playing field too confined, the operating theater too cramped. He has done all the right things, and now his company is prepared to compete on a larger stage. But where to go? New York stores and restaurants, especially those in the city, lack any kind of representation, a snobbery of the worse kind. And there is where the fault lies, not in our stars. While the New York region is not saturated, not nearly by half, there is almost nowhere else to sell his wine in the state. And it's hard outside of the state. That is because New York has not done a good job of selling itself outside the region. Local folks, tri-staters, would sooner sell or buy a Washington or Oregonian wine, let alone Greek or Hungarian (sorry, I like wines from both regions, just using you as an example…my apologies) than feature small artisanal craft wineries from New York. If anyone is busting at the seems, it’s Fox Run, whose wines are carried in stores in New Jersey and Pennsylvania, among many. But while Scott has been banging the drum or sounding the clarion call (or whatever metaphor you would prefer to insert), not so many wineries have joined him. New York state is funny like that. A lot of individuals. At least in the Finger Lakes they seemed to have found a common cause. But the fault, in fact, dear Brutus, is that we are underlings! As usual, New York state wineries were the proverbial dumb blonde. While Scott was pushing the issue, the wineries as a group missed their chance to force a shotgun wedding, and finally walk down the aisle with their long time object of affection. That is why the wineries are underlings. Now will the liquor stores owners, who needed the wineries when they were down, will they finally commit? Or will it be another two or three years of hemming and hawing and excuses until Scott can force the issue again? Scott did his part. The wineries failed to take advantage of his play. Now the trump card clearly rests with the liquor store owners once again. New York wineries need to rise to the challenge. The onus is on them. They must strike a deal for a better partnership – or be ready to side with Scott the next time around. If there is a next time around, the law will be better written. It will be more fair. And liquor store owners will have more to fear. If the winery store owners forge a better working relationship, and help promote the entire industry, thereby lifting themselves, then they may have a better friend in Scott the next time around. New York wineries need to spread the word more effectively. More tastings in New York for New York press, retailers, and restaurants. 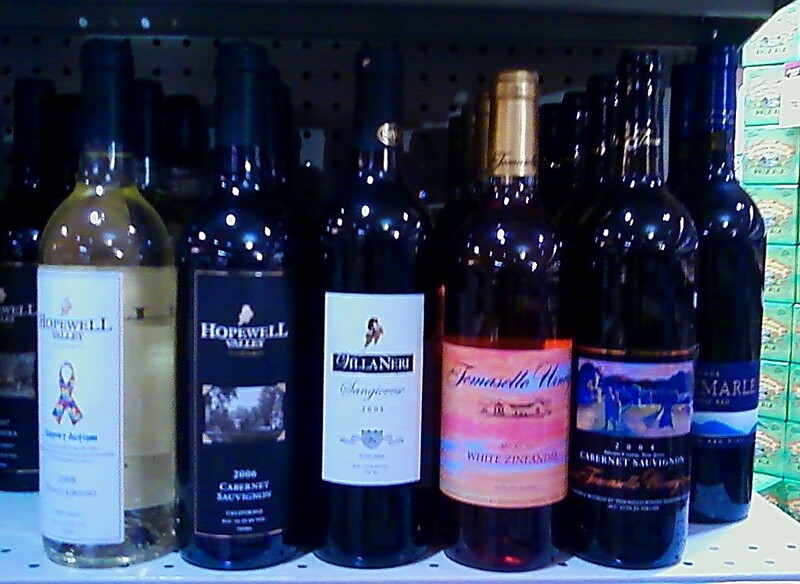 Better in store marketing for their wines – promotional materials, bottle tags, shelf-talkers, etc. The New York wine industry must learn fast and furious how to sell wine like they do in California and NYC, or else face playing the girl who gets dumped once again. Being invited to the party, and knowing how to dance, are two different things. 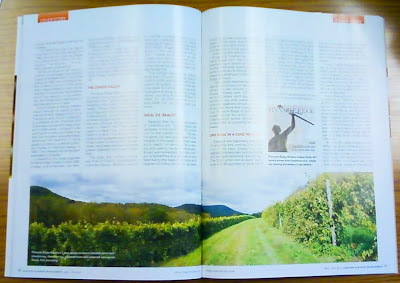 New York wineries also need to target new markets – Philadelphia, Boston, Orlando, and other cities. These issues remain at what’s at the heart of the real discussion. I’ve heard a few liquor store owners grumble about Scott. Don’t blame or persecute Scott Osborn. He was doing what was right. What was needed. He makes great wine. Any store who even thinks of shunning Osborn or Fox Run would be silly and unwise to leave on the side of the road one of New York state’s most dynamic owners and most sleek and well run wineries. His wine, and more New York state wine, should be in all the New York liquor stores. 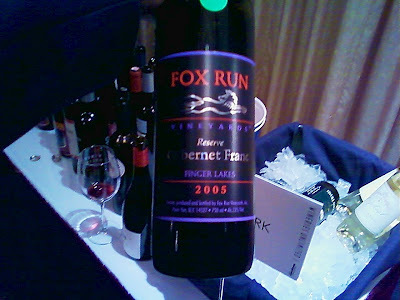 The Fox Run Cabernet Franc Reserve is one of my favorite Cabernet Francs. It's deep, rich, earthy, and complex. It fills the mouth with big dark fruit, dark cherries, black berry, dark raspberrys, a touch of cocoa, a touch of prune. It's a wonderful red, that finishes dry and beautiful. A wonderful accomplishment by Peter Bell, winemaker at Fox Run, who was featured in Wine Spectator in January of 2009. 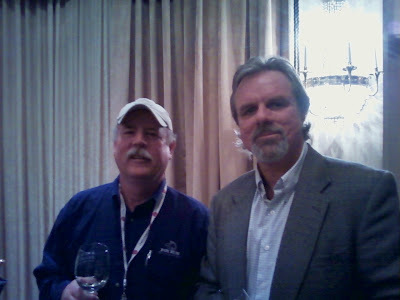 The winery is owned by Scott Osborn, pictured here with Raphael winemaker Richard Olsen-Harbich from the recent Wineries Unlimited. Thanksgiving Farm wines are made exclusively from grapes grown in the vineyards at Thanksgiving Farm.Thanksgiving Farm is located 20 miles due east of the U.S. Capitol in Washington, D.C., on a gentle ridge separating watersheds that drain to the West River and to thePatuxent River. 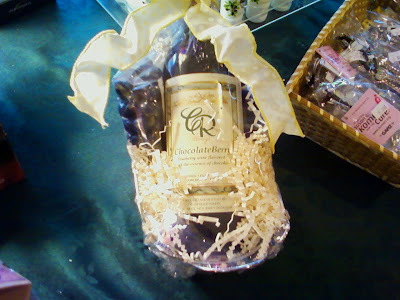 The farm and winery are owned by Doug and Maureen Heimbuch, in Harwood Ridge, Maryland, in Southern Anne Arundel County. 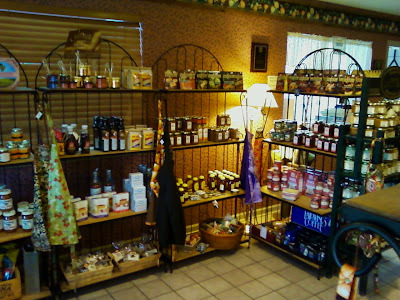 It is a family owned and operated business dedicated to grape growing and wine making. Thanksgiving Farm is not open to the public. Occassional tours and tastings, are available by appointment only. Thanksgiving Farm Meritage is their premium blend of Merlot, Cabernet Franc, Petit Verdot and Cabernet Sauvignon. 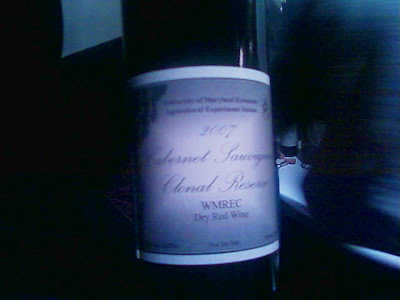 The 2007 blend favors the Merlot, so the wine is of a smoother, softer style. Merlot 64% Cabernet Franc 16% Petit Verdot 12% Cabernet Sauvignon 9%. It is a soft, dry red wine in the style of red Bordeaux. Lots of dark fruits, blackberry, plum, dark raspberry, a touch of prune. A hint of vanilla. Smooth. Very nice. A beautiful bottle of wine. AN OPEN LETTER TO JEFF SAUNDERS AND THE “LAST STORE ON MAIN STREET” – WHAT’S THE PLAN NOW? Now that the danger seems to have passed, and liquor stores have once again called on local wineries to help defeat the Wine in Grocery Stores Plan, it seems to me that this same coalition should not just shutter up the building until next year, when this same fight will rear it’s ugly head, and our liquor store “friends” will call on us again to fight the monster that is in the closet. I know I personally sent at least a dozen letters against the plan. 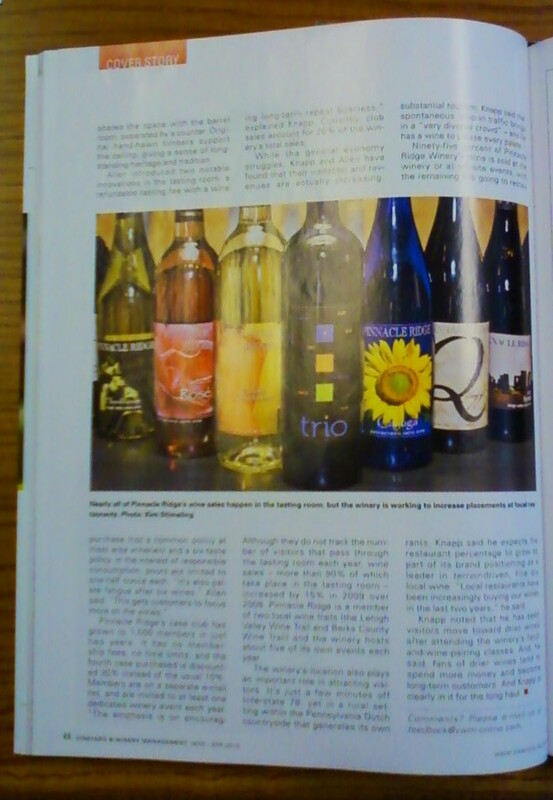 It seems to me that Jeff Saunders and THE LAST STORE ON MAIN STREET folks should now turn their efforts to creating a working partnership with their local wineries to encourage sales of local wine. 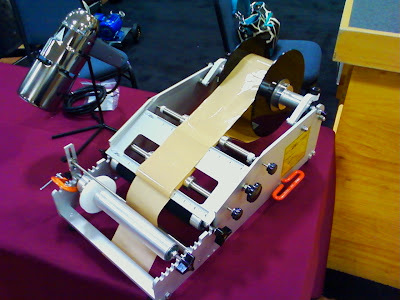 Jeff has sent out letters to that effect (see below – and a press release from LSOMS). And I have seen first hand the retailer/winemaker gatherings they have sponsored. I have seen some good things come from them. But I am still concerned. When the liquor stores were faced with the bleak prospect of 1900 new wine outlets, and the possible loss of their livelihoods, the local wineries, for the most part, backed them up. That’s what friends are for. But now it is the liquor store owners’ chance to do the right thing by their local wineries – and buy local wine. I’d say roughly half the liquor stores in our area do a great job selling local wine. And to them we say THANK YOU, with real sincerity and heartfelt thanks. They are good partners that work in concert with their local wineries. Better yet, they are friends. And we were happy to support them. The other half will go back to selling California, French, Italian, Spanish, Chilean, and South African wines, and leave New York state wines comfortably in their rearview mirror, their existence marked safe for another year. Now is the time to start working the relationship in the other direction. It is time to feature local product in your stores, and join the local food movement, so popular everywhere else. I for one am tired of seeing Greek and Hungarian wine (I actually adore Tokai and a few Hungarian reds) flaunted in a store, but New York state wines are no where to be found. I have nothing against either of those countries, nor their wines. But, what kind of idiocy is that? What kind of rude treatment is that? Feature obscure, evolving regions, and disrespect the local producers? Especially those getting 80s and 90s in the big rating magazines?! New York wines continue to get rave reviews from the Wine Spectator, Wine Enthusiast, the Los Angeles Times, and the New York Times, as well as popular blogs, such as The Pour and the New York Cork Report, among many news outlets, but many state liquor stores turn their backs. Can you imagine walking into a California store that sells wines, grocery or other, and imagine not finding a California wine? So how is that the case here? As I have said before, Scott Osborn is not wrong. I like Scott. He’s a smart man, and a good wine maker. He has turned Fox Run into a successful, quality producer. 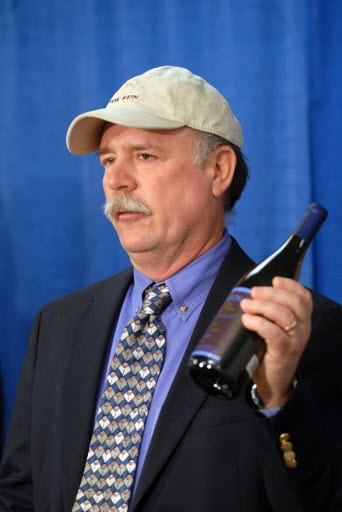 He is a great champion of New York state wine. His fight is not without it’s merits. It was to his detriment that the legislation was written so poorly, otherwise he might have won the fight. He is right. There are not enough outlets for NY state wines. If you minus half the state’s liquor stores (because they don’t carry NY wine), there are few retail outlets to grow a winery businesses. And there are fewer liquor stores than there used to be. The math isn’t hard. If the liquor store owners can’t or won’t help the wineries grow their businesses, more wineries will rightfully join Scott’s side in the next fight. This letter is NOT meant to be a threat! On the contrary, it’s meant to be an entreaty to help us build a stronger partnership together, to improve good friendships, and build new ones. To create together an industry that will blossom in the 22nd Century. I hope that hand extends from one side of the aisle to another. 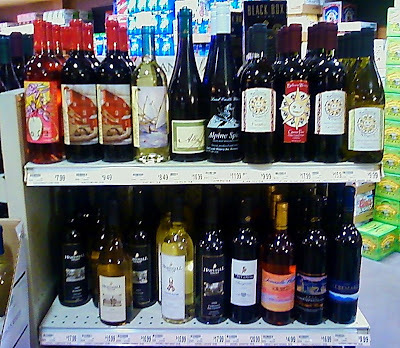 The New York State Senate today released its budget resolution that rejects Governor Paterson’s job-killing plan to legalize wine sales in 19,000 new outlets. This is the first step in formally rejecting this bad idea. The Assembly is expected to take a similar step this week, which should all but assure defeat for this dangerous proposal. We are continuing to work hard to ensure its final defeat, but wanted you to know that we hope that the end of this battle will allow us to focus on building a better and stronger industry based on ideas that help stores and wineries grow and thrive. We have had two roundtables between retailers and wineries so far, and have the third planned for tomorrow (March 23) at Duck Walk Vineyards on Long Island. The events in Hudson Valley and in the Finger Lakes started a very positive discussion that we hope to continue, and ultimately, help produce an action agenda we can work together to achieve. The Senate budget resolution also calls for restoring $950,000 for the Wine and Grape Foundation, which we trust is also of interest to you. I want to express my continued appreciation for those wineries who joined with us in our effort to defeat the Paterson plan this year, and extend an invitation to all wineries to work with us as we move passed this divisive issue once and for all. If we work together, there is nothing we can not accomplish. NEW YORK, NY March 22, 2010 – Leaders of the Last Store on Main Street today praised the New York State Senate for its budget resolution that rejects Governor Paterson’s job-killing plan to legalize the sale of wine in 19,000 new outlets across New York State. The New York State Assembly is also expected to adopt a resolution this week rejecting this bad idea. “Senator Sampson and his colleagues have sided with small businesses over Big Box stores in rejecting this dangerous proposal for the second consecutive year,” said Jeff Saunders, founder of the Last Store Coalition and president of the Retailers Alliance. “In the worst economy this state has seen in generations, it makes no sense to put 4,500 people out of work just so greedy Big Box stores can soak up more corporate profits. Governor Paterson’s bad plan would have closed more than 1,000 stores and put 4,500 people out of work without creating a single new job. In addition, by increasing access to wine – which has three to four times the alcohol content of beer –underage drinking and drunk driving would have also increased. As a result, law enforcement organizations across the state opposed the dangerous plan. In addition, 100 New York wineries opposed the idea, recognizing that grocery stores would have given shelf space to cheap imported wines, shutting New York wineries out and limiting their availability to consumers. “We applaud the State Senate for taking the first step to reject this dangerous idea, and look forward to a final budget that closes the book on this money grab by Big Box stores once and for all,” said Stefan Kalogridis, a Last Store Coalition leader and president of New York State Liquor Store Association. 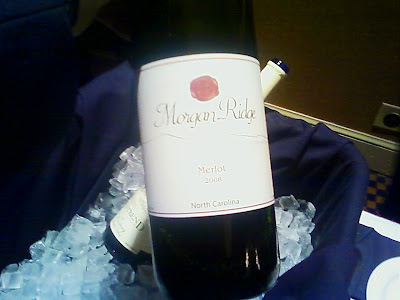 Located in central North Carolina, Morgan Ridge Vineyards grows grapes in a location that is becoming prominent in the vineyard and winery industries. Morgan Ridge Vineyards is one of the largest vineyards in North Carolina. It is located near Gold Hill, North Carolina. On a hillside facing east, the vineyards are exposed to the sun in the morning and early afternoon. 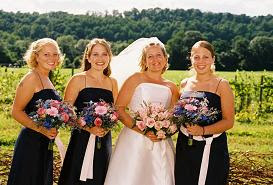 Amie Morgan Baudoin is the manager of this winery located at 1401 East Main Street, in Albemarle, North Carolina. This was a big ruby color, like the color of a dark bowl of black cherry Jello. But it tasted nothing like Jello. This was a nice, medium bodied, dry red. This was one beautiful wine. Smooth. Easy drinking red. Very, very nice. One of my favorite things about Wineries Unlimited is meeting people I've never met before, or spending time with people I've never had the chance to meet before. And some times drinking their wine. This is not the first time I've written about Joe. He is a very important person in the Maryland viticultural landscape. He's a grape and fruit guy. But unlike a lot of University Extension guys (not all), Joe likes to make good wine from the grapes he's growing. And like Three Dog Night says, "I helped him drink his wine. He sure had some mighty fine wine." 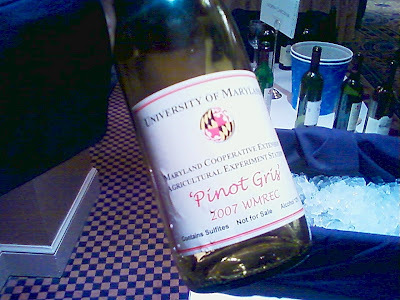 The Maryland Grape Research and Fruit Statewide Extension and research programs in viticulture, enology, and tree and small fruits are being created and implemented at the Western Maryland Research & Education Center by Dr. Joseph A. Fiola, Viticulture and Small Fruit Specialist. Dr. Fiola holds a B.S. in Horticulture from Cook College, an M.S. in Horticulture from Rutgers University, and a Ph.D. from the University of Maryland. He has been with Maryland Cooperative Extension since 2001. Dr. Fiola has over 20 years of academic and industry experience in research and extension in viticulture and enology. He organizes annual events such as: Regional Beginners' Grape Growing Workshop; Regional Winter Fruit Meeting; Summer Orchard Tour; Field Days; and Twilight Meetings and Tours. Joe oversees Cultivar Testing, Pest Control and Vineyard Nutrition and Enology. It's his enology work I am most concerned with here. Small batch enological studies are conducted on the new grape varieties to determine their wine quality. Also, research has been conducted into understanding annual vintage variability, as well as utilizing various enological tools to make the best wine possible with each specific "vintage" of grapes. Vinified products from Dr. Fiola's new grape variety research have won awards in the American Wine Society's (AWS) International Competition. Experiments with cryo-concentration for “ice” wines from grapes and apples are being conducted. Joe is a busy man. But while I was at Wineries Unlimited, I tasted three of his wines. I tried the 2007 Pinot Gris; 2007 54 36 33 New Russian Hybrid; and the 2007 Cabernet Clonal Reserve. The Pinot Gris was light, citrusy, clean, bright, and very drinkable. The New Russian Hybrid was an off dry white wine with a touch of sweetness and a bright fruity nose. And the Cabernet Sauvignon was incredible, medium bodied red, with raspberries, plum, and vanilla. Impressive. Like to know more about this clone. They were really exceptional wines. Of all the wines I've tried of extension winemakers, his are consistently the best. And that's great for all of us! I was just talking to David Jackson, Twitter wine enthusiast, and sales Director at Hudson-Chatham (in the spirit of full disclosure, I work with David on a daily basis). 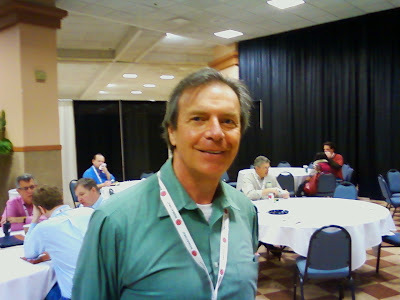 He had gone to Viticulture 2010, and was coming back from the New York Wine Expo 2010. The liquor store/grocery bill was much on his mind. Now, I was just reading Leon Adams’ famed history of wines in America, which was last edited in the late 1980s, and in it, he was writing about the grocery store bill that was being battled over even back then. And David said at the debate about the grocery store bill at Viticulture 2010, that some one quoted a newspaper article from the 1970s that also sounded like it was written just yesterday. In both articles, the same attitude prevailed – it’s not a matter of if, it’s a matter of when. David has his own twitter account, and I don’t want to steal David’s thunder. He has many opinions on the subject, but he said one thing that I agreed with – in this whole giant mess, the one thing has remained a constant – the liquor lobby has spent every last dime in a desperate fight to defeat, delay, and kill this bill at every possible moment. However, they have not spent one quarter of that money (not a tenth, maybe not even one hundredth) coming up with a plan to help their member stores prepare for the future. There are fewer liquor stores today than there were five years ago. Restaurant sales are down. Wholesale sales of wine are down. What is the trade liquor group doing to help its constituents plan for the future? How are they preparing their members to inoculate themselves should the grocery store bill some day pass(and eventually it will)? I will go on record that as of this writing, I do not think the bill is fair and equal. I’ve said it before. The state is not giving liquor store owners enough to work with to combat grocery stores on a level playing field, as they will indeed be fighting for their livelihoods (many of them any way). I think there needs to be more in the law for liquor store owners. If grocery stores can sell wine, why can’t liquor stores widen substantially the other items they are allowed to sell? What the state liquor store association is not doing, however, is working on a plan that shows liquor store owners how to get along in the new word order, should it happen. It turns out, like in American national politics, scaring people to death is much more effective than teaching them how to move forward. Maybe the NYSLSA should have an amber alert, etc. Where’s the planning ideas on how to rejigger your product selection? Where’s the information on what to buy with the new laws in place so that you can keep your store fresh and competitive? Where’s the ways to differentiate your self and selection from the grocery stores? What can a liquor store provide that a grocery store can’t, and how to promote yourself better, etc.? It’s certainly not on their website. Scott Osborn will eventually get his way. As I’ve said before, he’s not wrong. And he won’t quit. What then? Where are the contingencies? Should the NYSLSA be showing their people how, now? On top of this, I cannot tell you how many wine shops I walk into that don’t carry New York state wine. I’m lucky, in that, in Columbia County, NY, there are a dozen shops I know carry a decent selection of NY state wines. And I buy from them. I think those folks are great, and I know they care about sustainability and great wine. I know they are good people. But I’ve gone to a lot more that don’t carry NY state wines at all. The NYSLSA has come knocking on all our doors, begging us to help support them. And there are handfuls of quality wine shops that do stock a decent representation of New York wines. But I know that number is less than half. More than likely it’s less than one quarter, that support their local wineries. It is an outright shame. There is no way that once the big grocery chains get the right to sell wine that they will carry the smaller New York state wines. Wegman’s for example, who sells wine in other states, will carry the same supply they do now, which is a decent representation. I give them kudos. 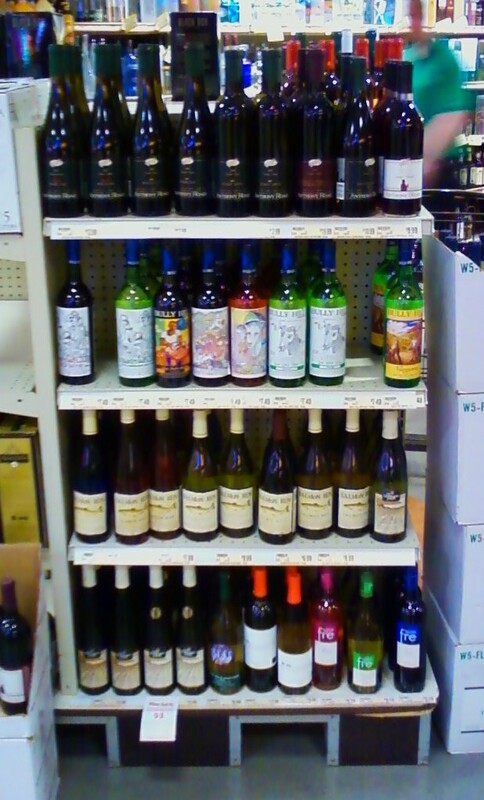 In New Jersey they carried a half-dozen local New Jersey wines. That was more than I could say for a handful of independent wine shops in the local area. In New York it will be the same. The rest of the large stores will carry low priced, boxed wines, and cheap glutted, over runs from California and South America. What will retailers do? I have one of the ways they can succeed. 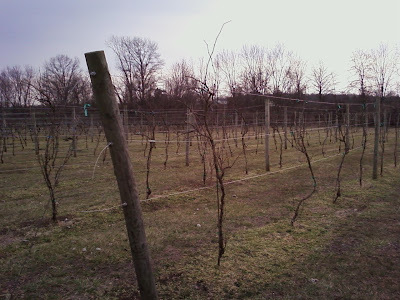 One of the things they can do is embrace their local New York state wineries. 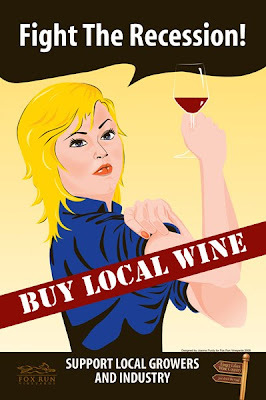 Local is everything these days….except in many liquor stores. Local is the buzzword of our times, right now. But walk into especially some of the poshest wine shops, and ask for New York state wine, and they look at you like you asked for ripple. Local wineries can support in-store tastings. The small wineries offer these kinds of marketing opportunities all the time. Local winemakers are always thrilled to come in and talk with your best costumers. The local wineries, unlike California and South America, want to be your partner. They want to help you. They’ll supply you with point of purchase material, and other promotional materials to help you sell your product better. Talk to your local winery, and see if they don’t lunge at the chance. And partner up with your neighbor instead of some guy from out of town! So, Wineries Unlimited, came and went like the wind this year. Each year I so much look forward to Wineries Unlimited. Each year seems to move so much faster than it's predecessor. How is it so? Wineries Unlimited has been over now for weeks. Damn! Well, one of the most heavily attended classes I saw, was the packed classroom for Growing High Quality Wines in Extreme Conditions. It was very informative, and it went very, very well. Another popular class was Self-Distribution. Many of this years classes were dealing with increasing profits, growing better fruit, better wine making techniques, and packaging and sales. 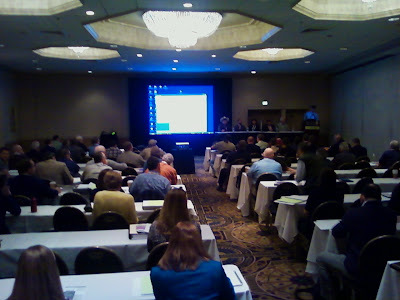 It was a very practical conference, and one that was perfect post the awful growing season and fiscal year that was 2009. Kudos to Richard Leahy and the magazine staff for a solid curriculum. I think there were fewer people and vendors this year, as Viniculture 2010 was in Rochester only weeks before. But it seemed a solid show, and I saw many faces. 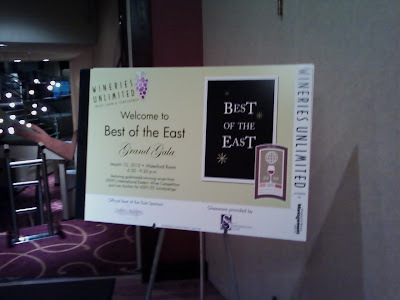 Mike Migliore of Whitecliff Vineyards of the Hudson Valley was there. Winemaker Brad McCarthy of Montfair and several other Virginia wineries was there as well. There was much cautious optimism about this year's weather. Many north east wine makers had just not seen a growing season like that in their entire lives. "I saw guys who where growing wine for twenty or thirty years walk away from their vineyards with nothing," commented vineyard manager extraordinaire Steve Mudd. He said he never worked so hard as he did last year, trying to save crops. Luck and site location were at an optimum last year. Equipment, both vineyard and winemaking, as well as bottle, corks, and label seemed at the core of everyone's interest. Pricing was the big talk in the aisles. Everyone wanted to raise prices, reduce coasts, and pull as much profit from their businesses as possible. As usual it was good to see friends and familiar faces. 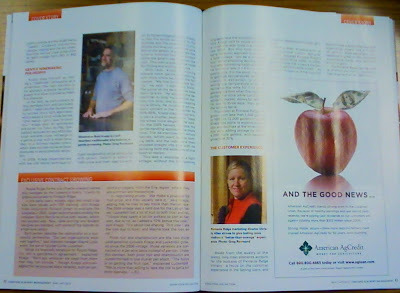 Each year one looks forward to chatting about business, winemaking, and stories. This year's event was no different. Laughs. Work. Knowledge. Not a bad combination. The trip was well worth it! Now it's back to work. Nothing to look forward to, but bud break. Which is not a bad thing, but you can;t hang out and have a glass of wine with those buds. I actually miss it already. 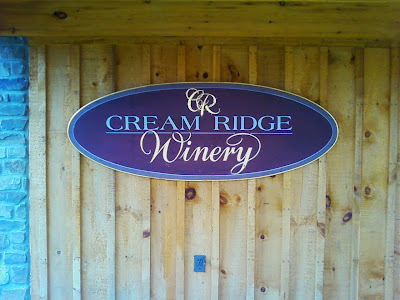 When I was in my teens, going through my "Breaking Away" phase, speaking French and Italian, and riding my ten-speed to the shore and back, I used to pass, on Route 539 riding out of Trenton, Tom Amabile's Cream Ridge Winery. I rode past that winery dozens of times, and I was always enamored of it. Years later, when I had moved back to New Jersey as an adult, and was of drinking age, I went there to see it for myself. Passing by the winery in my youth, it had inspired me to explore the wines and wineries of other local regions. Now was my chance to finally enter and part take. The winery specialized in fruit wines almost exclusively. Tom was an friendly man. A retired gentleman, he made wines like Cherry Amabile and Plum Wine. He was always ready with a story, a joke, or a bit of information. He was always eager to talk wine. He didn't know me from Adam, but he was ever the font of information and knowledge as I wrote my wine book, and dreamt more and more about owning my own farm. So when I went down to Wineries Unlimited, I found myself getting off of Exit 7 and winding my my way to Cream Ridge on a cloudy Wednesday afternoon. 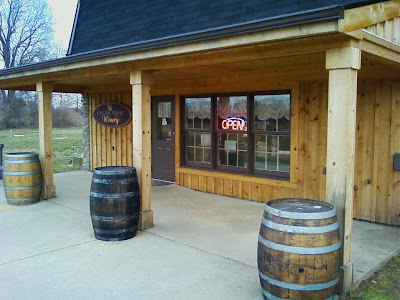 The winery is open seven days a week. It was strange. Certain things had not changed - the building, the parking lot, the landscaping. Other things had changed. The first difference I saw was all the trained vines behind the winery. 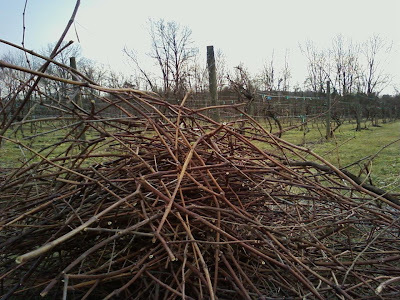 Tom couldn't seem to grow vines effectively, which was why he made fruit wines, but now here were mature vines, trained and pruned, with a large pile of cuttings placed near the parking lot. People were in the vineyard working as I arrived. A very nice, genial young lady greeted me at the tasting counter. She handed me a slip filled with tasting notes. There were many wines, but only some were fruit wines. The rest were vinifera and hybrids. Dry reds and wites filled the list of wines available to taste. 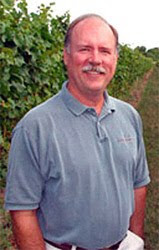 The wines today are made by Brian Mulligan. He's a third generation Amabile. And he's got a more classic palette than his grandfather. I started with a Suvignon Blanc that was fruity and dry and lemony, and then moved onto a fragrant Gewuztraminer which was grapefruit-y and delicious! 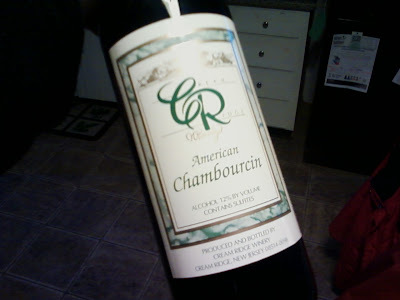 The next was one of my favorites - Chambourcin. That is not to say Chambourcin is my favorite, or even among my favorites, but in New Jersey, Chambourcin has taken on a life of it's own. There are now many good Chambourcin's in New Jersey. Add Cream Ridge's to the list. This was a nice, medium bodied, dry red. Aged in oak, this had lovely cherry and dark berry notes. A hint of vanilla. Nice tannins and good structure. A very, very nice red! Next up was the Merlot. Lot's of raisin and plum. A very, very nice medium bodied dry red. Very drinkable. Then came the 100% New Jersey Cabernet Sauvignon. A big, full bodied red, with a beautiful garnet color. Dark cherries. Raspberry. Hints of vanilla. Plum. A very, very nice big, dry red with nice balance. Very impressive. There were lots of beautiful gift baskets made up. Not available when I was there, were the Freedonia and the Cream Ridge Red, two of their best sellers. Regardless, it was a nice visit. I felt so good after I made my purchase, and proudly brought a bottle of New Jersey wine with me all the way to upstate New York and our farm. A little piece of home. Made me feel good.